In my early 20’s (I’m showing my age) I worked for companies that used typewriters to type letters, and a basic DOS program to create spreadsheets. One company I worked at, I introduced them to Microsoft Excel as an alternative to pencil, paper, and a calculator to create their financial business plan. I also remember learning how to use the DOS version of WordPerfect (circa late 80’s). Based on this history, and the fact that I’m a long time Windows user, I have often struggled with using a Mac, especially, when I’m used to the Windows shortcut keys. To help me adapt, I’m sharing my favourite 5 computer tips for Mac users. Over the years, I’ve discovered not everyone knows the difference between the delete and backspace keys. The delete key, deletes the characters on the right of your cursor, whereas the backspace key, deletes the characters on the left of your cursor. I often reach for a delete key on a Mac keyboard, only to find it is not there so I need to move my cursor and use the backspace key. I recently discovered if you hold the Function [fn] key down and press the Backspace [<—–] key, or Control [ctrl] and [D] keys, these actions it will delete characters on the right of the cursor. It took me a while to understand that the Finder was the equivalent to Windows Explorer, and once I understood this, I found it very efficient in the way it displays the folders and path of files. I also discovered that if you hold the Command [⌘] key (also known as the Apple key) down and press the Spacebar, you can find documents, apps and other files on your Mac. I also discovered that if you wanted to preview a file, not open it entirely, you can click on a file once, and then press the Spacebar. I was impressed by the viewing option. On a Windows computer you can take a snapshot of your screen using your keyboard, or if you wanted to capture only part of your screen, you can use the Snipping Tool. While assisting a client, I found this to be a challenge as I rely on these two features heavily, especially if I’m creating instructions for my team or for clients. After doing a Google search, I discovered shortcut keys for both these options. To create a screen grab of any part of the screen on a Mac, you can hold the Command [⌘] and Shift keys down, and press the number 4 key. Once you’ve done that, click and drag out a box over the part of your screen you wish to capture. Upon release, the image will be saved to your desktop. If you want to capture the whole screen, hold the Command [⌘] and Shift keys down, and press the number 3 key. To do this you can use a feature built into QuickTime, a program that comes with every Mac as standard. Go to your Applications folder (if it’s not already on your shortcuts bar) and open it. Click File > New screen recording. This will allow you to record the whole of the screen or just a portion of it. It’s super useful for things like tutorials – it can also capture sound. And the last but not least favourite tip has to do with closing the hundreds of Finder windows. I don’t know if it was my lack of experience with using a Mac, or if this is something Mac encourages, however, I’d often find myself with a lot of Finder windows open on the desktop and would close each one individually. I wasn’t aware that you could merge all the windows together, which I think is a fabulous option. To do this, click on the Windows option in the menu bar, then click Merge all windows. What was previously multiple windows will now appear as neat little tabs within one window. 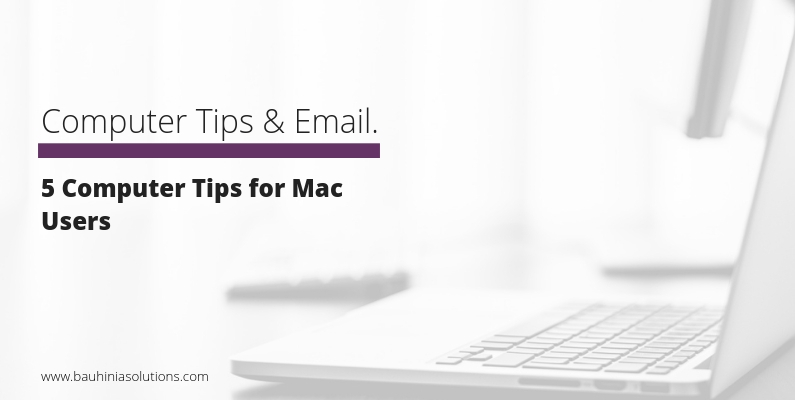 If you have any other tips for Mac Users, pop them into the comment box. I look forward to reading them.